You would think this post was sponsored by Kiehl's, right? Nope. My husband just loves this brand that much. Naturally he can thank me for introducing him to it, and once he started he was hooked. Now with that being said, most skincare items out on the market today can be used by both men and women. However, my husband is still convinced that all the products I have are for women and that he needs products for himself. *side eye* Ok, fine. 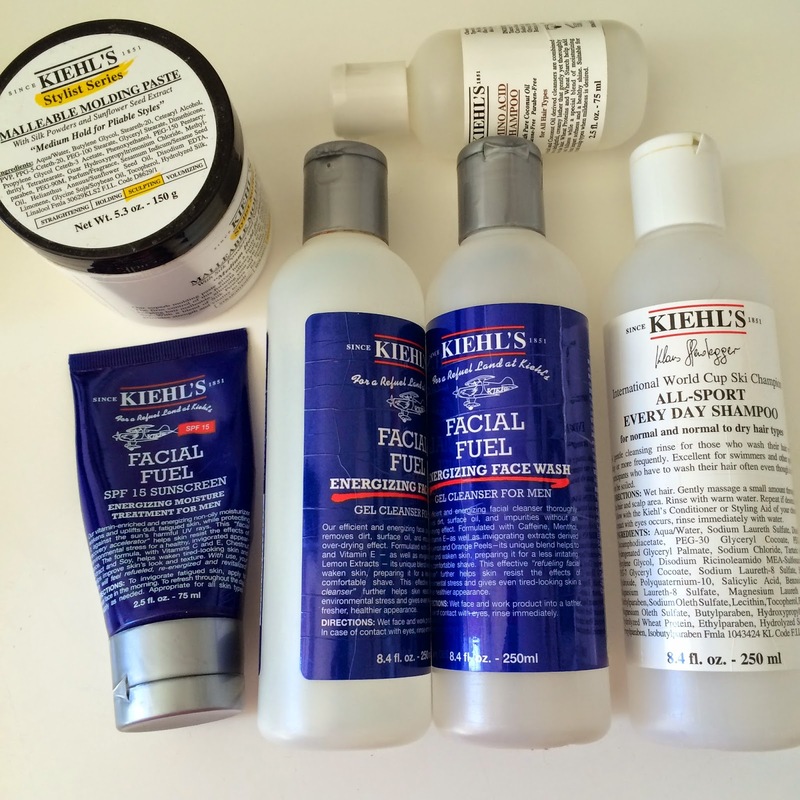 So off to Kiehl's we went years ago, and he hasn't looked back since. As a pretty serious Kiehl's lover myself, I completely support this skincare monopoly he has created for himself. While he has tried a few other brands out there, he tends to always find his way back to Kiehl's. So when they sent over their newest Oil Eliminator line for men - my husband was ecstatic ("a package for ME??!!" was his exact response). So here is a look at some of his recent additions along with some tried and true staples. And the second pic is proof of his obsession......his recent Kiehl's empties (which you can bring back to Kiehl's stores to recycle and get FULL SIZE products - here are all the details). 1. Facial Fuel No Shine Moisturizing Lip Balm - I have approximately 15,000 lip balms at home, but noooooooo he wants to wear this one. It's matte, softening and super easy to carry around. Now if only he could remember which pants' pocket he leaves it in. 2. Ultimate Man Body Scrub Soap - As if the name wasn't 'manly' enough, this is a serious bar of soap. Made with bran and oatmeal, this scrub is one of his favorite products. I recommended he buy this a few years ago, and he has been in love with it ever since. "It makes my skin soft and stuff" was his response when I asked him what it did. I guess that says it all. 3. Ultra Facial Moisturizer SPF 15 - Shhhhhh, this techincally isn't part of the Kiehl's men's line but he doesn't need to know that! He alternates between the Facial Fuel moisturizer SPF 15, and this Ultra Facial Moisturizer SPF lotion. SPF was mandated by me (I'm bossy, what can I say), so this is what we ended up with. It soaks in immediately which he loves, and I can feel good knowing his face isn't frying in the sun. Hashtag compromise. 4. Men's Oil Eliminator Deep Cleansing Exfoliating Face Wash - His regular staple face wash is the Facial Fuel Energizing Face Wash and this face scrub (which I had to make him use "exfoliation is NECESSARY, OK????!!!"). But he is always concerned about his oily skin so this face wash was the perfect one to try, and it's quickly becoming his favorite. He says there is a nice cooling sensation when using, it really gives a good deep clean and is the perfect product for the summer to help his skin stay matte. 6. Men's Oil Eliminator 24-Hour Anti-Shine Moisturizer - After the first day, he was enjoying this immensely. It's not heavy, nor does it have a "sticky" feeling on the skin (his words not mine), and really helps the skin stay matte for a good part of the day. I am thrilled he is loving his new skincare additions but if he starts taking longer than me to get ready in the morning, we are going to have a problem. And be sure to check out the fun social media campaign Kiehl's is running to celebrate their Oil Eliminator line. Read more here. After buying my dad some things from Kiehl's for Christmas he has been in love. They mae such great products! What a great gift for Dad! I'm obsessed with the Oil Eliminator... I was going to share with my guy friend but I couldn't help holding onto it just for myself... whoopsie! I do think Kiehl's does a great job for men's products though! Ok now you have motivated me to try it now! !